Penelope had her eyes tested by the StEPS program. 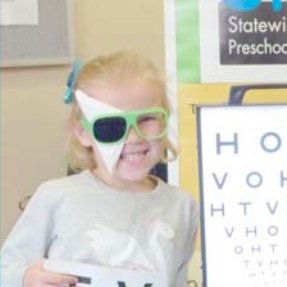 Parents and carers of preschool aged children are being urged to take advantage of the State-wide Eyesight Pre-schooler Screening program (StEPS) by the Central Coast Local Health District. The program offers all 4-year-old children in NSW an eye check before they start primary school, to ensure any issues are identified and treated early. “It is highly recommended that all 4-year-old children have their vision screened,” said District CEO, Dr Andrew Montague. “To benefit fully from treatment, childhood vision problems need to be treated before school entry, during the critical vision development period,” Dr Montague said. Registered Nurses regularly visit preschools across the Coast to conduct the StEPS program.